A Long March 2C rocket rose from the mountainous terrain of China’s Xichang Satellite Launch Center on Thursday as part of the country’s fifth orbital space launch of the year, deploying the fourth set of Yaogan-30 reconnaissance satellites. 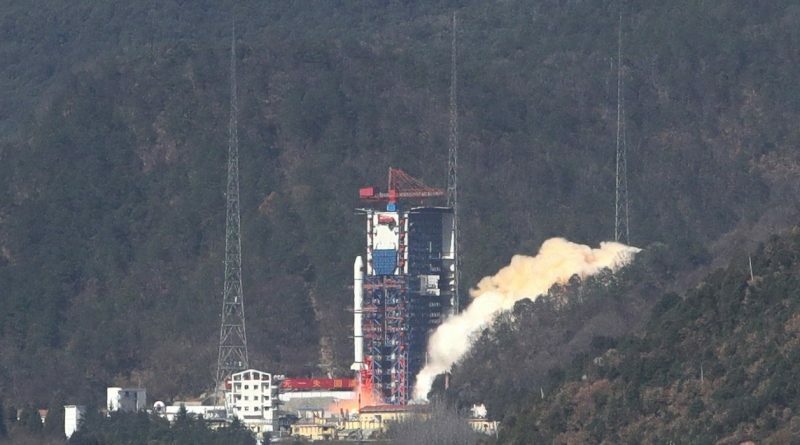 Long March 2C took flight at 5:39 UTC, 1:39 p.m. local time and flew to the south east to dispatch its payloads into a 600-Kilometer orbit to join a growing constellation of satellites. Yaogan Weixing is the primary designation of China’s reconnaissance satellite fleet and translates as “Remote Sensing Satellite.” Missions of this type have often flown under the cover of being Earth-observation satellites in use for scientific experiments, land surveying, crop yield assessment and disaster monitoring. The first Yaogan satellite launched in 2006 and the constellation saw a steady launch cadence through 2016, operating three types of satellites: optical reconnaissance spacecraft with a ground resolution exceeding one meter, Synthetic Aperture Radar Satellites for day-and-night, all-weather imaging capability and formation-flying trios of electronic intelligence satellites to track foreign vessels and intercept communications. 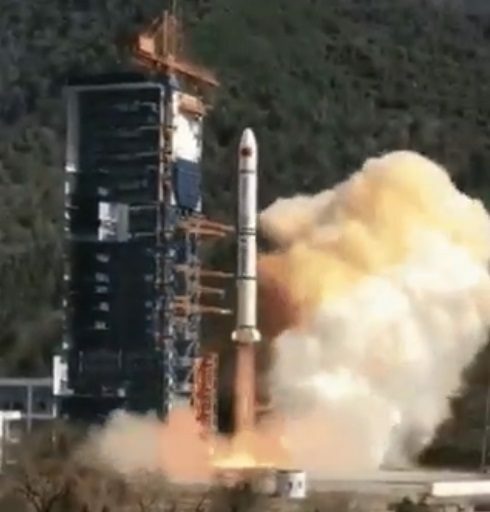 The Yaogan-30 sub-constellation within the broader Yaogan architecture has been a special case, seeing a rapid deployment to constellation strength in a period of only three months. 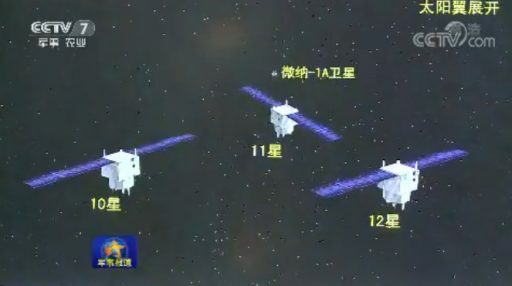 The first Yaogan-30 trio lifted off on September 29, 2017 and, unlike the previous Yaogan triplets that flew in close triangular formation, entered a pattern optimized for coverage with three satellites separated by 120 degrees in their orbital plane. 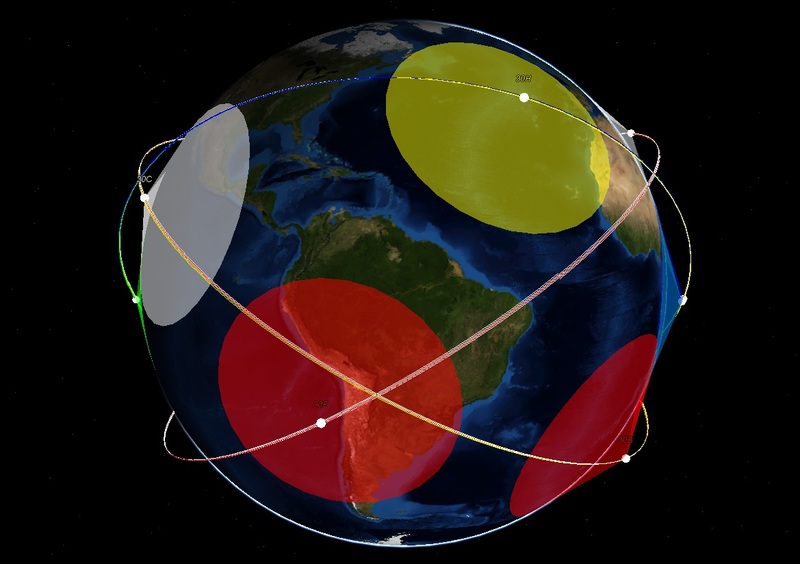 Two additional planes were added to the constellation via triplet launches on November 24 and December 25, creating a three-plane constellation with a separation in RAAN (longitude of the ascending node) of roughly 120 degrees – giving the constellation a revisit time of 30 minutes for most locations falling within its visibility range. The purpose of the Yaogan-30 constellation appears to be some form of intelligence gathering, either through miniaturized optical sensors or electronic intelligence systems; radar can be ruled out based on the depiction of the Yaogan 30 satellites in official TV reports which do not show any deployables like SAR antennas. According to Chinese space officials, the Yaogan-30 satellites are tasked with “electromagnetic detection and related technical tests” which could be seen as a neat cover for an ELINT constellation since, under the scope of such a mission, electromagnetic detection would be a truthful descriptor of the satellite’s overall purpose. The Yaogan-30 missions are also flying under the Chuang Xin 5 designation given to them by their manufacturer CAS (China Academy of Science). Previous CX missions launched between 2003 and 2014 involved miniaturized store-and-forward communications satellites. 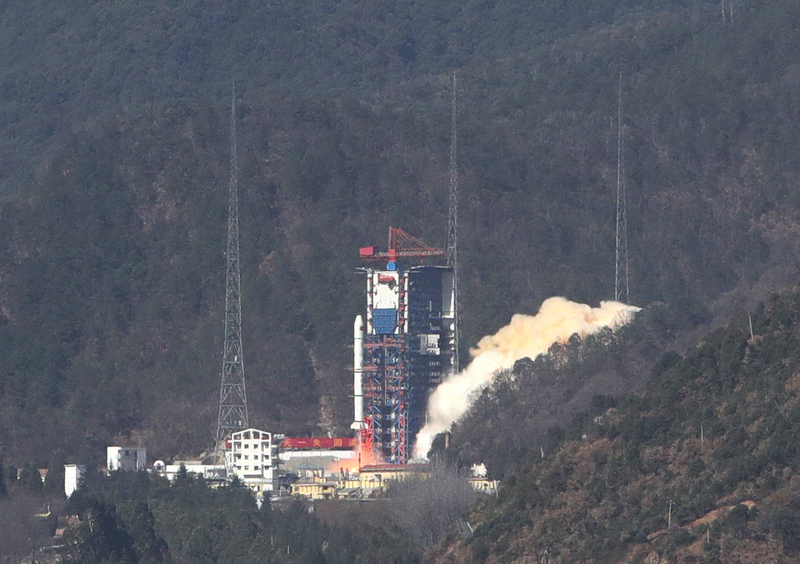 Thursday’s Yaogan-30 Group 04 launch followed the same pattern as the three previous missions, involving a Long March 2C rocket blasting off from Xichang’s LC-3 launch pad and directly dispatching the three satellites into a ~600-Kilometer, 35-degree orbit. The exact launch time was given as 5:39:04:986 UTC and orbital data provided by the Joint Space Operations Center shows the satellites in an orbit of 585 to 599 by 603 to 613 Kilometers at the expected inclination of 35°. 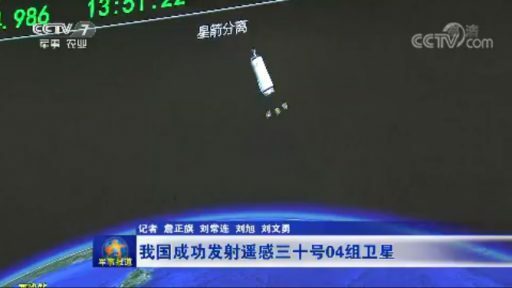 According to Chinese reports, Thursday’s launch also carried a micro satellite called Weina 1A. Yaogan-30 Group 04 has entered the same orbital plane as Group 03 launched in December, matching in Right Ascension of Ascending Node (182°). It now remains to be seen where the three new additions to this orbital plane will stabilize, the expectation being an even 60-degree spacing between each member of the plane to continue improving the constellation’s revisit rate. A theory of Yaogan-30 employing differently-instrumented satellites (e.g. combining ELINT & optical satellites in a single constellation) appears to be off the table based on TV reports of Thursday’s launch, showing the satellites to be identical in appearance to the first three Yaogan groups. As one plane of the constellation increases to six, it is strongly implied that the same will be done for the other two Yaogan-30 planes over the coming months to increase the constellation to 18 members. The pace with which these initial deployments occurred suggests Yaogan-30 is pursued as a priority under the China’s space-based reconnaissance program. The low inclination for the mission appears peculiar compared to the 63° orbits used by the original Yaogan triplet formations and the U.S. Naval Reconnaissance Satellites – covering a greater latitude range. However, the 35-degree orbit of the Yaogan-30 series provides coverage of the world’s major population centers as well as the most frequented shipping lanes including areas of interest like the South China Sea, North Korea, the entire continental U.S. and the Chinese mainland. Whether their purpose is in optical reconnaissance or signals intelligence, Yaogan-30 provides the Chinese with a powerful tactical and strategic tool in the form of near-continuous insight into activities across the world’s oceans and geopolitical hot spots. 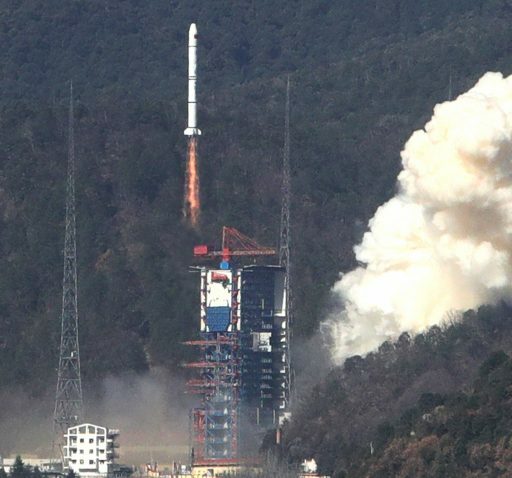 In action on Thursday was the Long March 2C rocket, conducting its 45th mission. A member of the Long March family, the 2C vehicle was derived from the DF-5 ballistic missile and first flew back in 1982, keeping a solid record with only one previous failure. CZ-2C is a two-stage rocket standing 40.4 meters tall, 3.35 meters in diameter and weighing around 233 metric tons at liftoff, capable of placing 3,800 Kilograms into Low Earth Orbit. Both Stages of the Long March 2C use Nitrogen Tetroxide and Unsymmetrical Dimethylhydrazine as propellants while an optional third stage in the SMA and SM versions of the launcher uses solid propellant. The first stage of the stack is 25.7 meters long and 3.35 meters in diameter with a launch mass of 171.3 metric tons including around 162.7 tons of self-igniting propellants. It hosts a YF-21B rocket engine, representing a cluster of four YF-20A engines each providing 750 Kilonewtons of Vacuum Thrust and firing for 122 seconds. The second stage of the launcher is 7.58 meters in length and shares the first stage’s 3.35-meter diameter with a liftoff mass of 58,000kg, holding 54,700kg of propellants for consumption by a single YF-22 main engine and a four-chamber vernier engine tasked with providing attitude control. YF-22 provides a vacuum thrust of 742 Kilonewtons and each YF-23 vernier has a vacuum thrust of 10.2kN. The second stage has a burn time of 130 seconds for the main engine and up to 287 seconds for the verniers to accomplish a circular orbit insertion when required. The optional SMA Upper Stage is 2.7 meters in diameter and 1.5 meters long, generating a thrust of 10.78 Kilonewtons by burning 150 Kilograms of solid propellant. Flying in its two-stage configuration, Long March 2C can lift 1,400 Kilograms into a typical Sun Synchronous Orbit, increased to 1,900 Kilograms when enlisting the help of the optional third stage. Long March 2C can also be used for highly elliptical orbit missions including Geotransfer launches with a payload capacity of up to 1,250 Kilograms.